Playa Blanca - Traditional fishing village in the southern part of the island, and now a popular resort with lovely beaches, including Papagayo. Lovely views of Fuerteventura from every beach. Apartments La Avenida is located on the beachfront in the tranquil resort town of Playa Blanca, Lanzarote, Spain, with its shops and restaurants. Built in 2003, this whitewashed three-storey apartment complex has typically Mediterranean styling. There are good sea views from the two beach-facing terraces to the front of the property. The islands of Lobos and Fuerteventura are clearly visible, as is the harbour with ferries and catamarans docking and departing. Fishing trips are available nearby and windsurfing is available. The 12 one-bedroom apartments include a kitchen-diner and a terrace. All have light contemporary decor, modern furnishings and tiled floors. They are equipped with satellite television, DVD players and safes. The kitchens come with ceramic hobs and ovens, refrigerators, coffee/teamakers, dishwashers and washing machines. Bungalows Lanzasur is located in Playa Blanca in Lanzarote, Spain, within one block of the sea and one kilometre from Marina Rubicon. This modern complex offers bungalows surrounded by greenery and close to the sea. There is a recreation area with two swimming pools, one of which is heated during the winter, and a large hot tub. A fitness centre provides guests with a gym, aerobics classes, sauna, Turkish baths and a massage room. Bungalows Lanzasur's main restaurant serves buffet-style dishes for breakfast and dinner, as well as themed buffets throughout the week. There is a separate swimming pool, a mini club and a play park for children. A games room offers a pool and billiards table, games machines, board games, table tennis and darts. The hotel's sports centre includes three tennis courts, a basketball court, mini golf, beach volleyball, archery and rifle shooting. The Hotel Volcán Lanzarote is located in Playa Blanca de Yiaza, Lanzarote, Spain, 795 metres from Playa Blanca Beach, 900 metres from the main village, and 10 kilometres from Timanfaya National Park. 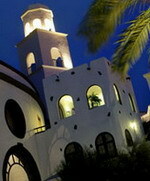 The hotel is designed to mimic one of the island's traditional villages, with piazzas, patios, and fountains. 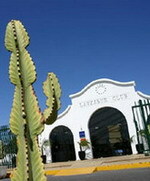 It has a marina which offers sailing and windsurfing lessons, catamaran excursions, and a diving school. The hotel's four swimming pools are surrounded by extensive gardens and terraces with sunloungers. The wellness centre offers a variety of treatments and facilities, including a massage treatment room, Turkish bath, Jacuzzi, sauna, and hair salon. Hotel Volcán Lanzarote offers four restaurants including a Japanese restaurant.There is a fitness centre with a squash court, and snorkelling equipment, fishing rods, and bicycles can all be hired from the hotel. The H10 Princesa is a sprawling white-built hotel, located just 200 metres from the white sandy beach on Playa Blanca in Lanzarote, and 500 metres from the village centre. The Buffet Restaurant adds drama with show cooking and the Barbecue Restaurant in the pool area serves fresh grills. Shows and evening entertainment are on offer in the Papagayo Bar and the Piano Bar. Drinks and cocktails are served in the garden La Choza Bar and the swim-up Cocoloco Bar. Families will appreciate the kids' club, with all-day entertainment in the high season, laundry facilities and onsite shop. Pampering is on offer in the shape of a hairdresser and massage service. The 407 rooms are decorated with cool tiled floors, dark wood furniture and patterned fabrics. Located on the picturesque Canary island of Lanzarote, Spain, is the expansive resort of H10 Rubicon Palace. Four restaurants offer cuisine for all tastes from themed specialties served buffet style at Tabaiba and Janubio Restaurant, which also offers a children's buffet and show cooking. Chorzo serves a salad bar and barbecue buffet by the pool. In the square, guests find Venecia, which serves Italian fare, and after which, Beefeaters English Pub is open for a pint. Drinks of all kinds are served poolside at Coco-Loco tropical bar and the piano bar offers cocktails and live music. The evening out would not be complete without dancing at the Montaña Roja Dance Hall. Six pools with waterfalls and bridges give guests ample opportunity to enjoy the Atlantic sun. Guests can be pampered with a facial or massage in the spa, or enjoy activities from mini-golf, to archery, to giant chess in the Sports Center.